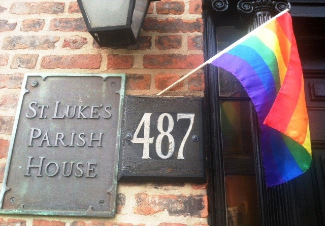 Art & Acceptance is a weekly Saturday evening drop-in program for LGBTQ+ young people ages 16-24 experiencing homelessness, hosted by St. Luke’s Church. Our mission is to offer a safe, hospitable, harm-reduction, gender-diverse, nonsectarian safe space. The program includes a nutritious home-cooked dinner and to-go bag with a second meal, space for arts, writing and dance, a free clothing and toiletries “shop,” health and legal services, and crisis support. Activities, including the communal dinner, run throughout the evening. Once a month we host an open mic, where the young folks express themselves through theater, poetry, and music before an audience of peers, staff and volunteers. We hold a monthly community meeting, a brief circle of staff, volunteers, and people served, to gather feedback about the program and needs. Volunteers are critical to every part of this program. They help serve food, run the shop, participate in games, and other tasks. Please note: You must be at least 21 years old to volunteer. Volunteer slots are also available via New York Cares. If it's your very first time volunteering with us, please drop us an email. Write jillartandacceptance (at) gmail.com and let us know you're coming. Thanks! There will be no program on April 20, 2019.